Huge Savings Item! Free Shipping Included! Save 13% on the Rage Powersports DEER-HOIST-SWIVEL 360 Degree Swivel Hitch Mounted by Rage Powersports at Kart Racing Network. MPN: DEER-HOIST-SWIVEL. Hurry! Limited time offer. Offer valid only while supplies last. Rage Power Sport hitch-mounted deer hoists convert a vehicle hitch into a game cleaning station ideal for cleaning, skinning, irrigating, and aging. 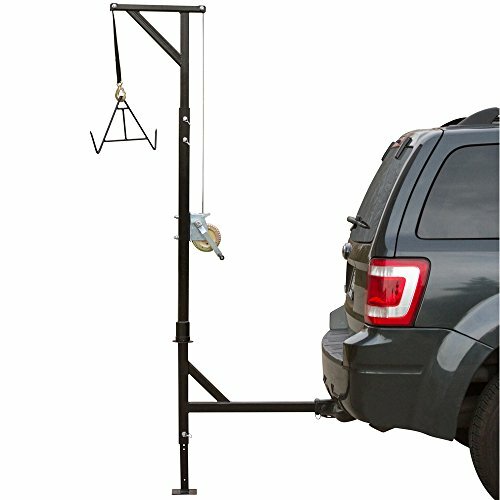 Rage Power Sport hitch-mounted deer hoists convert a vehicle hitch into a game cleaning station ideal for cleaning, skinning, irrigating, and aging. The hoists are available in fixed position or swivel-base designs that include a lift gambrel, lift strap, and winch. The height-adjustable frame reaches between 81-1/2" to 92-1/2" high and the gusset-reinforced steel frame provides 2-1/4" hitch clearance.